Rehn Hall, Room 10, is not your typical classroom. Located in the College of Business (CoB), it’s a melting pot that brings together all kinds of CoB students and is not only a tutoring center, but also a study hall. The Business Academic Success Center, as it is officially known, is the hallmark of the College of Business, if not one of the most distinctive feature. “I believe this is the first year that the university has their own dedicated space for a tutoring center. The College of Business happened to be the first to dedicate its own tutoring space before the university or any other college on campus other than the athletic department”, says Jill Gebke, assistant dean. To encourage academic success and help students strive for excellence, Rehn 10 offers tutoring for many of the most challenging courses for Business students, including math, finance and accounting. Long gone are the days when receiving tutoring was seen as a sign of weakness. The current eight tutors on staff are popular not only among struggling students but also A-students. “We see every type of student. It is a really neat blend of who is choosing to use the center. Even if you are a great student, you may not be familiar with accounting. Come on down, you can start doing your homework here, use it as a study hall. I think having tutors available right there as you work through a problem is very helpful”, said Gebke. The center has designated time slots in which tutors are available for particular topic areas. Gebke encourages students to either make an appointment or just walk-in. Other available resources include group study sessions with tutors and test review units. A tutoring session at Rehn 10 is usually between 30 minutes to an hour depending on the current schedule, which is available on the College of Business website. 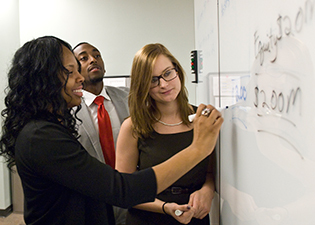 Funded by student directed tuition dollars, the Academic Success Center in room Rehn 10 is a service for and by students. That was part of the reason why Rehn 10 became possible”, said Gebke. The center is open Monday thru Thursday from 9 to 4:30 p.m. and, Friday from 9 till noon. Students interested in receiving tutoring are encouraged to visit the website https://business.siu.edu/services/advantage/rehn10.html. Any job openings will be posted on the Financial Aid job search board online.